Satyagraha (Sanskrit, meaning "Truth-force") was a term coined by Mahatma Gandhi to express his philosophy that non-violence is a power that can transform adversaries into friends and resolve issues of injustice and oppression. Gandhi developed this philosophy in his struggles against racial discrimination in South Africa and eventually employed satyagraha tactics against British rule in India during his campaign for Indian independence. His insistence on absolute non-violence as the power of truth won him international recognition for his peaceful way of dealing with conflicts. Gandhi's philosophy of satyagraha also had a profound impact on the thinking of Martin Luther King, Jr. during the Civil Rights Movement in North America during the 1960s. 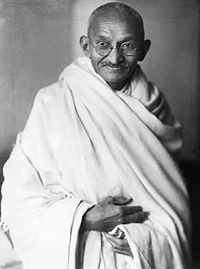 Gandhi first used the term "Satyagraha" in South Africa to describe his philosophy of active nonviolent resistance as opposed to "passive resistance." In developing his practical method of satyagraha, Gandhi was influenced by the concept of ahimsa found in the tenets of Jainism, as well as Jesus' Sermon on the Mount, Leo Tolstoy's The Kingdom of God is Within You, John Ruskin's book, Unto This Last, and Henry David Thoreau's Civil Disobedience. Its root meaning is holding onto truth, hence truth-force. I have also called it love-force or soul-force. In the application of satyagraha, I discovered in the earliest stages that pursuit of truth did not admit of violence being inflicted on one’s opponent but that he must be weaned from error by patience and sympathy. For what appears to be truth to the one may appear to be error to the other. And patience means self-suffering. So the doctrine came to mean vindication of truth, not by infliction of suffering on the opponent, but on oneself. In traditional violent and nonviolent conflict, the goal is to defeat the opponent or frustrate the opponent’s objectives, or to meet one’s own objectives despite the efforts of the opponent to obstruct these. In satyagraha, by contrast, these are not the goals. “The Satyagrahi’s object is to convert, not to coerce, the wrong-doer.” Success is defined as cooperating with the opponent to meet a just end that the opponent is unwittingly obstructing. The opponent must be converted, at least as far as to stop obstructing the just end, for this cooperation to take place. Civil disobedience and non-cooperation as practiced under Satyagraha are based on the “law of suffering,” a doctrine that the endurance of suffering is a means to an end. This end usually implies a moral upliftment or progress of an individual or society. Therefore, non-cooperation in Satyagraha is in fact a means to secure the cooperation of the opponent consistently with truth and justice. 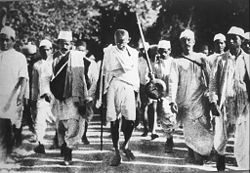 Gandhi leading Salt Satyagraha, a notable example of Satyagraha. …an honest, respectable man will not suddenly take to stealing whether there is a law against stealing or not, but this very man will not feel any remorse for failure to observe the rule about carrying headlights on bicycles after dark.… But he would observe any obligatory rule of this kind, if only to escape the inconvenience of facing a prosecution for a breach of the rule. Such compliance is not, however, the willing and spontaneous obedience that is required of a Satyagrahi. Gandhi envisioned satyagraha as not only a tactic to be used in acute political struggle, but as a universal solvent for injustice and harm. He felt that it was equally applicable to large-scale political struggle and to one-on-one interpersonal conflicts and that it should be taught to everyone. Friends have sent me two newspaper cuttings criticizing my appeal to the Jews. The two critics suggest that in presenting non-violence to the Jews as a remedy against the wrong done to them, I have suggested nothing new… What I have pleaded for is renunciation of violence of the heart and consequent active exercise of the force generated by the great renunciation. …there should be unadulterated non-violent non-cooperation, and if the whole of India responded and unanimously offered it, I should show that, without shedding a single drop of blood, Japanese arms—or any combination of arms—can be sterilized. That involves the determination of India not to give quarter on any point whatsoever and to be ready to risk loss of several million lives. But I would consider that cost very cheap and victory won at that cost glorious. That India may not be ready to pay that price may be true. I hope it is not true, but some such price must be paid by any country that wants to retain its independence. After all, the sacrifice made by the Russians and the Chinese is enormous, and they are ready to risk all. The same could be said of the other countries also, whether aggressors or defenders. The cost is enormous. Therefore, in the non-violent technique I am asking India to risk no more than other countries are risking and which India would have to risk even if she offered armed resistance. ↑ M.K. Gandhi, Satyagraha in South Africa (1926, ISBN 978-8172290412). ↑ M.K. Gandhi, Non-violent Resistance (Satyagraha) (Dover Publications, 2001, ISBN 978-0486416069). ↑ M.K. Gandhi, Statement to Disorders Inquiry Committee (1920). ↑ M.K. Gandhi, “Requisite Qualifications” Harijan March 25, 1939. ↑ R.K. Prabhu and U.R. Rao (eds. ), “The Gospel Of Sarvodaya,” in The Mind of Mahatma Gandhi (Ahemadabad, India, 1967). Retrieved December 21, 2007. ↑ R.K. Prabhu & U.R. Rao (eds. ), Between Cowardice and Violence in The Mind of Mahatma Gandhi (Ahemadabad, India, 1967). Retrieved December 21, 2007. ↑ 7.0 7.1 M.K. Gandhi, “Some Rules of Satyagraha” Young India (Navajivan) (1930). ↑ R.K. Prabhu & U.R. Rao (eds. ), “Power of Satyagraha,” in The Mind of Mahatma Gandhi (Ahemadabad, India, 1967). Retrieved December 21, 2007. ↑ M.K. Gandhi, “The Law of Suffering,” Young India (1920). ↑ M.K. Gandhi, “Pre-requisites for Satyagraha,” Young India (August 1, 1925). ↑ M.K. Gandhi, “Pre-requisites for Satyagraha” Young India (August 1, 1925). ↑ M.K. Gandhi, “A Himalayan Miscalculation,” in The Story of My Experiments with Truth. ↑ M.K. Gandhi, “The Theory and Practice of Satyagraha” Indian Opinion (1914). ↑ M.K. Gandhi, Non-violent Resistance (Satyagraha) (1961), p. 37. ↑ M.K. Gandhi, “Qualifications for Satyagraha” Young India (August 8, 1929). ↑ M.K. Gandhi, “The Jews” Harijan (November 26, 1938). ↑ M.K. Gandhi, “Some Questions Answered” Harijan (December 17, 1938). ↑ M.K. Gandhi, “Non-violent Non-cooperation” Harijan (May 24, 1942), p. 167. Gandhi, M.K. Satyagraha in South Africa, 1926. ISBN 978-8172290412. Gandhi, M.K. Non-violent Resistance (Satyagraha). Dover Publications, 2001. ISBN 978-0486416069. Gandhi, Mohandas Karamchand. The Collected Works of Mahatma Gandhi. Dehli: The Publications Division, Ministry of Information and Broadcasting Government of India, 1958. OCLC 78194711. Gandhi, and Bharatan Kumarappa. Non-Violent Resistance (Satyagraha). New York: Schocken Books, 1961. OCLC 249247. Gandhi, R.K. Prabhu, and U.R. Rao. The Mind of Mahatma Gandhi. Ahmedabad: Navajivan, Pub. House, 1967. OCLC 1075783. Gandhi. The Story of My Experiments with Truth. Boston: Beacon Press, 1957. ISBN 0807059803. This page was last modified on 26 February 2011, at 19:17.